The latest version of Photoshop elements includes many new photo-enhancing options and guided step-by-step tutorials that automate image editing and processing. 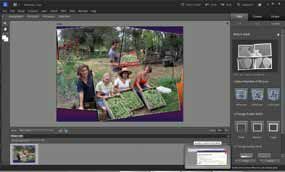 Quality and Effectiveness: Image editing tools in Photoshop elements 10 operate like their counterparts in Photoshop. any photo created or edited by elements 10 can be opened and edited by Photoshop (and vice versa). but Photoshop elements 10 has fewer tools and drop down menus than Photoshop, and its colorful workspace has a friendlier more inviting interface. Ease of Use: Installation and setup proceed without a hitch. three simple options appear at launch: organize or edit your pictures, or sign in with your adobe id to register and get access to backup and sharing services. both the editor and the organizer user interfaces have an intuitive look. when you open a picture in the editor, three tabbed menus appear at the right: edit, create, and share. Top Features: Two integrated but separate digitalimage applications work together so that users can easily edit their digital pictures; text on a shape or path, crop guides, new photos effects, and photo-fix tools give users an excellent tool kit; helpful guided edits and video tutorials provide step-by-step instructions. Overall Rating: adobe elements 10 provides ordinary users with a variety of digital touch-up tools for adjusting a picture, adding a caption, changing a color, and fixing redeye while working in a Photoshop-like environment that’s not overwhelming.